In this catalogue we present our new and forthcoming titles of 2016. Our Press continues to be a hub of scholarly publishing at Leiden University. We aim to produce titles that make major contributions to international scholarly debate. 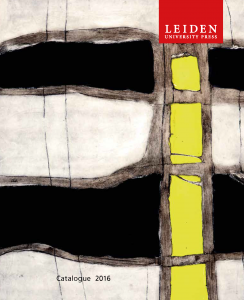 LUP also publishes books related to the unique and diverse collections of Leiden – the museums and the collections of our University. These books are richly illustrated and we take pride in our high design and production values. This year we present a new series Colonial and Global History through Dutch Sources, that focuses on the dynamic interaction between different civilisations in world history.